President Donald Trump tweeted that it was "so weird" to "watch Crazy Bernie" on Fox News. Fox News' most famous viewer watched the network's Monday night town hall with Sen. Bernie Sanders, and his review is in: "Very strange." President Donald Trump tweeted about the 2020 hopeful's appearance Tuesday morning, writing, "So weird to watch Crazy Bernie on @Fox News." He also seemed taken aback by the addition of the network's newest contributor, former Democratic National Committee head Donna Brazile. Trump has repeatedly ripped Brazile for tipping rival Hillary Clinton off about a question before one of her 2016 debates with Sanders. "(A)nd now we have @donnabrazile?" his tweet concluded. Baier took the Trump tweet in stride, tweeting back, "Thanks for watching Mr. President — we'd love to have you on a town hall soon." "We cover all sides," he added. The newsman responded to other Twitter commentators, too — some who were positive about the town hall, and one who was negative and accused him of allowing Sanders to "lie to you in saying Congress will give up their Cadillac insurance for single payer." "You get me sick," the viewer tweeted. "Sorry I make you sick," Baier responded. "Hope you feel better." Sanders was the first 2020 Democratic presidential candidate to do a town hall with the network. The DNC announced last month it would not allow Fox News to host any of the Democratic presidential primary debates, citing the network's close relationship with the Trump administration. 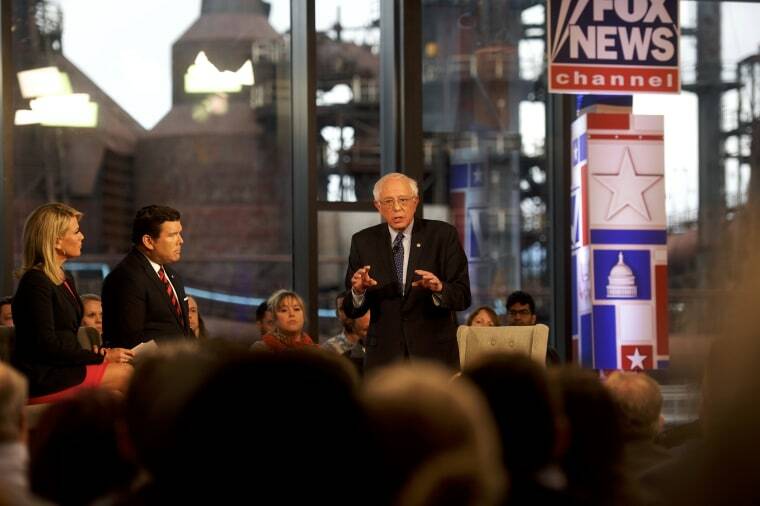 Fox News asked the DNC to reconsider, citing in part the work of Baier and Martha MacCallum, who co-moderated the Sanders' town hall. The DNC announced in February that NBC News, MSNBC and Telemundo will host the first 2020 presidential primary debate in June.